Yep, each one is a peeve. very BIG peeve. 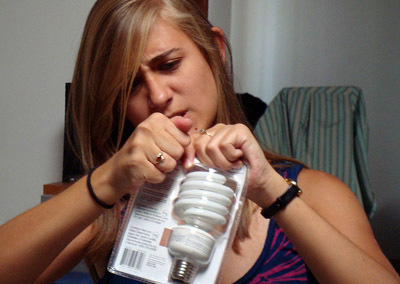 I hate the light bulb formed plastic ones – they are dangerous! I like Cracked, although some of the lists can be hit or miss at times. I definitely suffer from wrap rage, especially when it comes to opening things that are in blister packs. yeah, those blister packs fight back and I’ve been injured more often than I care to remember with them! Plus, just that day I’d bought some of those light bulbs that last for thousands of hours, like in picture, so I thought I’d share the serendipity! Oh yes, I have and get all cut up from them too! They are beasts! Indeed! I’ve always had trouble with the little paper pepper dispensers. Get them the least bit wet (salt too) and they’re useless! Well, that ould be the logical thing, except tall people pilfer too, you kow!!! You wouldn’t believe how many people end up in the ER with bad slices from all those impossible to open plastic wrapped packages! Fool for fractals – can’t wait! Cool – I too have been victimized, and I try to use my head when opening!! !